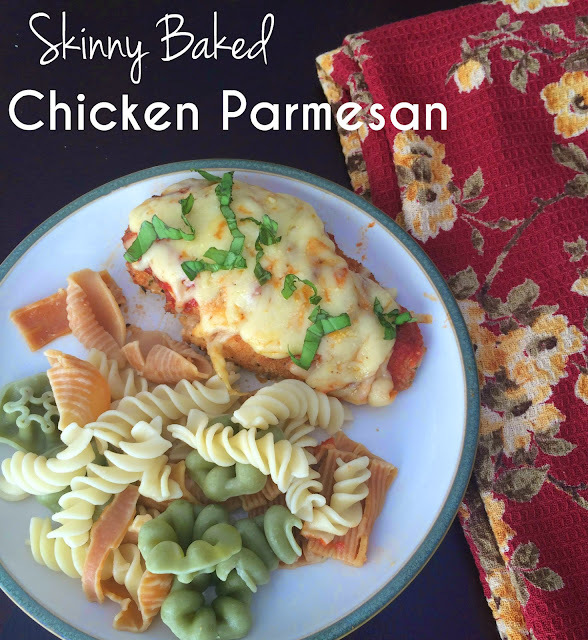 It really is so simple to lighten up classic dishes like Italian inspired chicken parmesan. I can't even tell that these cutlets are baked as opposed to fried once all the sauce and cheese is smothered on top. And I end up saving hundreds of calories with that one simple switch. Not to mention frying is so messy. This is a popular dinner in our house. The chicken stays moist with its coating of olive oil and breadcrumbs, as well as full of flavor. Serve with a side of pasta like these cute little shapes from Trader Joe's, or serve with a side salad to cut even more carbs and calories. Lightly coat the breasts in oil, and cover with the breadcrumb and parmesan cheese mixture. Top with sauce and cheese and bake until cheese melts. Serve with pasta or a side salad. Combine breadcrumbs and parmesan cheese in a bowl. Lightly brush the oil onto the chicken, then dip into breadcrumb mixture. Place on baking sheet and repeat with the remaining chicken. Bake chicken for 20 minutes, then flip over and bake for another 5. Be careful not to over bake. This will depend on the thickness of your chicken. Whole breasts will take longer. 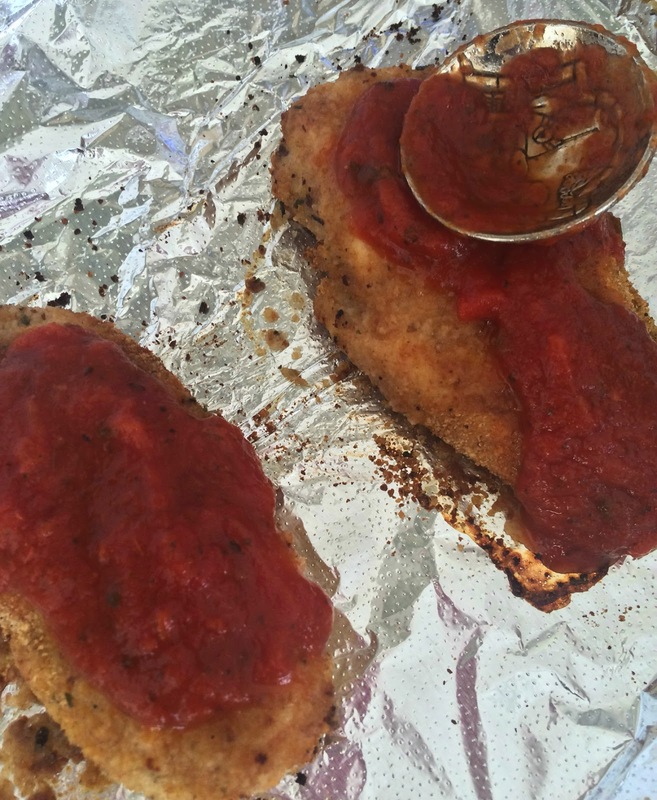 Once done, top each chicken breast with about 1-2 tbsps of marinara. Sprinkle 2 tbsps mozzarella on each breast. Bake for about 5 more minutes or until cheese melts. Garnish with fresh basil if you wish. 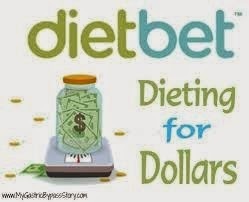 Lose Weight, Win Money with DietBet! Next week is a new chapter in my life. I start my final internship which means I'm in the home stretch of my school. In the spring, I can begin applying for school counseling jobs! I'm sooo excited. I've been on a long journey to get to this point. Also, I want to jump start my new semester with a weight loss challenge. I've been trying to burn off a few pesky pounds and it's been hard because of summer and all the social events I've been going to. Booze and bad food will pack it on, lemme tell ya. So, one of my favorite fit chicks, Melissa Bender, posted a challenge where you enter to lose 4% of your body weight in 30 days. So how much is 4%? Multiple your current weight by .04 and that is your weight loss goal. For a 150 pound person that is 6 pounds, for a 200 pound person that is 8 pounds. The "catch" is that you throw $30 in the pot to start. But if you meet your goal, you'll get your money back at a minimum. Additionally, you'll split all the earnings everyone else contributed and there are other prizes like gift cards and individualized workout plans. 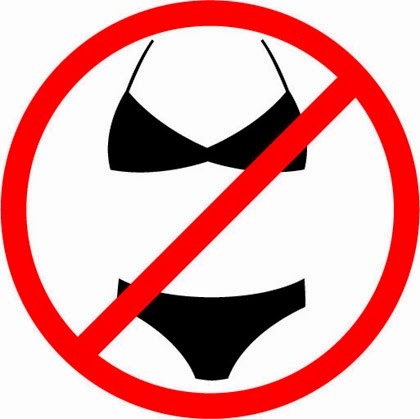 There's already over $1200 in the pot on Melissa's DietBet page. And don't worry, your weight and weigh in photos are all anonymous, so no one else will know what your starting or ending weight is. Go check it out! Let me know if you join. I already have and I'll update my progress through the next month. 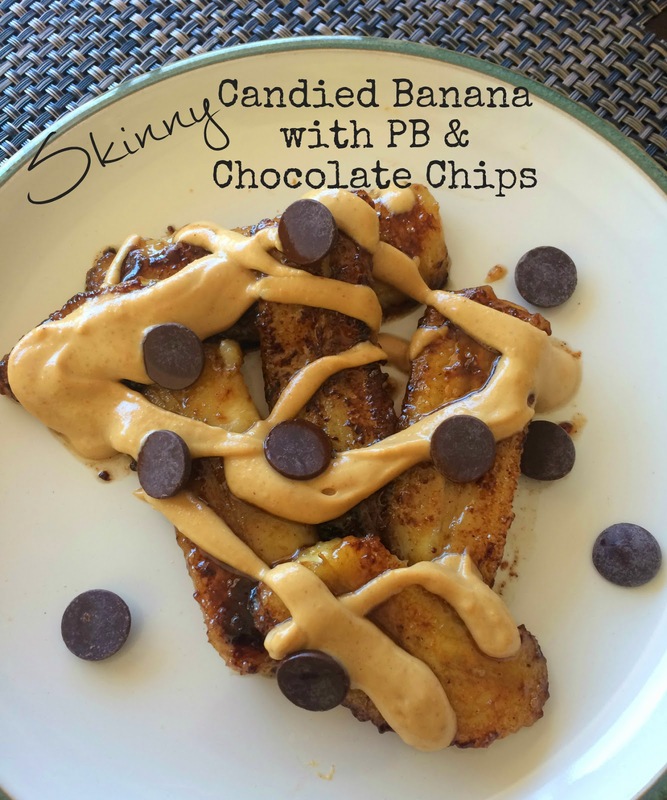 Disclaimer: this is NOT a bikini friendly recipe! I have been wanting to make this recipe for.ev.er. I finally decided to, and I can't tell you how impressed I was. I love love love blackberries. I think they are underrated. Far too many blueberry and cherry recipes out there. Although, if you're particularly fond of either of those, you can certainly sub out the blackberries with any berry or fruit of your choice. These bars are so delicious. 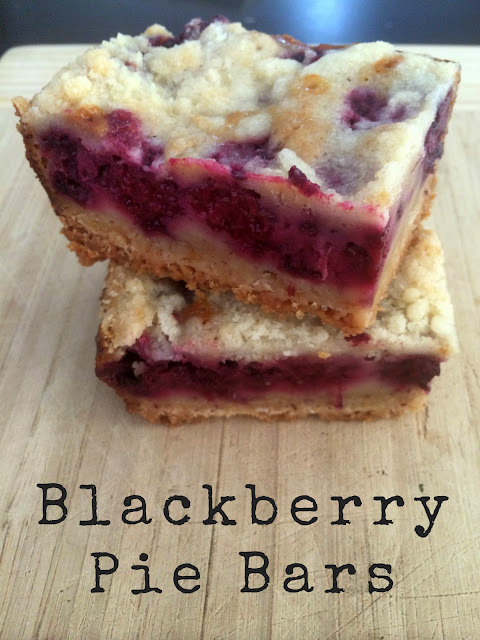 They have a buttery shortbread-like crust, with a sweet and juicy berry filling. All the summer flavor and buttery crusty texture of a pie, in convenient little bars. Look at those luscious layers... I think I need to go have another. Reserve 1 1/2 cups of the crumb mixture for the topping. Press the remaining crumbs into the bottom of the prepared pan. Bake the crust for 12-15 minutes (this actually took me close to 20 minutes; just continue checking it after 15 minutes), or until the edges just start to turn golden. Cool for at least 10 minutes. To make the filling: Whisk the eggs and sugar together in a large bowl, then add the Greek yogurt, flour and salt. Gently fold in the blackberries. Spoon the mixture evenly over the crust. Sprinkle the reserved crumbs evenly over the top. Bake for 45 to 55 minutes. The top crust should not be browned. It may not look done, but as soon as bars are set and edges just start to brown, remove from oven. Otherwise the bottom will burn. Cool for at least 1 hour before cutting. Makes approximately 2 dozen bars. 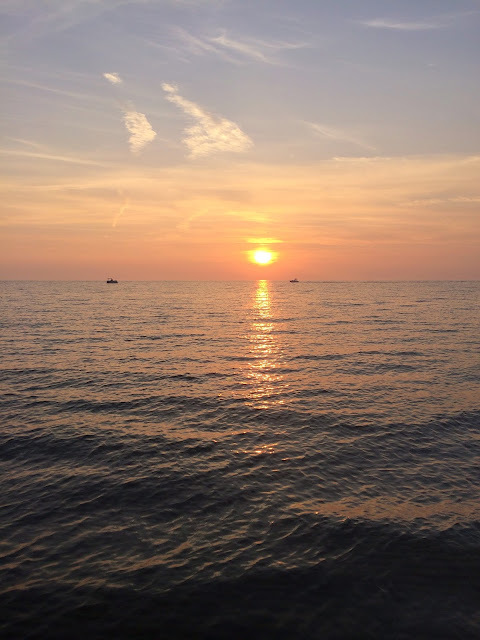 Two weekends ago, I went on vacation to visit my mom's side of the family in Michigan. My aunt has a cabin on Lake Michigan in a tiny little town called Onekama. Northern Michigan is known for its cherries and man, was I hooked! We had dinner at this lovely little restaurant, The Glenwood, and I had dried cherries in my salad with a cherry mustard vinaigrette... holy moly! I recommend vacationing up there if you ever get a chance. There are dozens of adorably quaint little towns and Michigan in the summer is absolutely beautiful. Doesn't Lake Michigan look like an ocean? One of the days my mom and I had lunch in another local town, Frankfort, at a bar and grill called Dinghy's. She ordered their Cherry Chicken and Almond Salad. Ah-maz-ing. I had to recreate it for myself! I ended up buying some local dried cherries up there, but unfortunately I ate the whole container before I got back to San Diego... oops! I highly recommend using cherries. 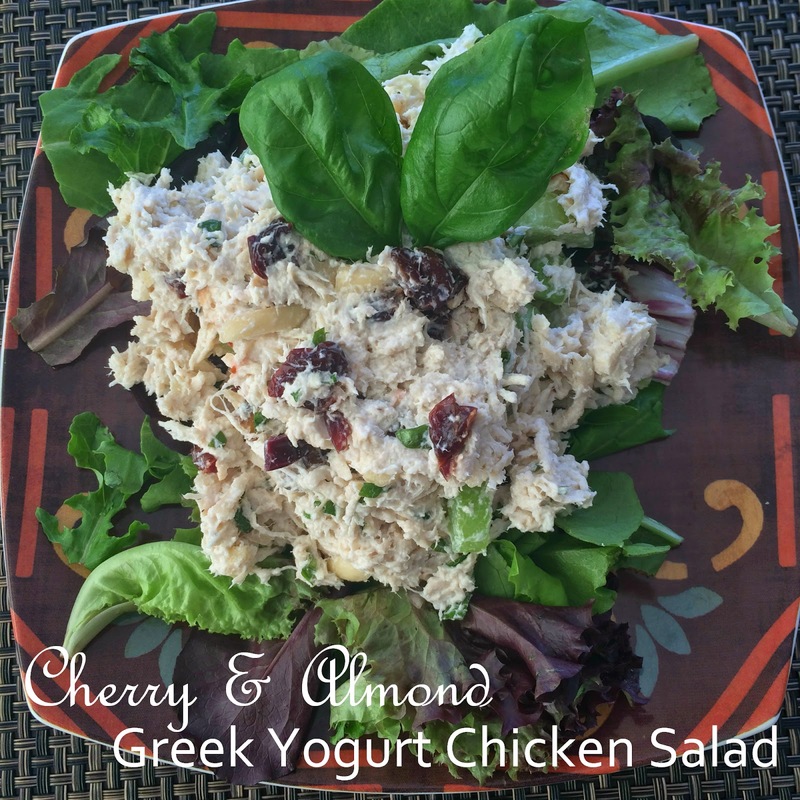 You may have seen my avocado chicken salad, one of my most popular posts, or my poppy seed Greek yogurt chicken salad. But this is a great twist with the cherries and basil. Replacing the mayo with Greek yogurt turns a pretty unhealthy, high fat and cholesterol dish into a light, low fat, protein packed meal you can feel great about eating. When chicken is cooled, place in a large bowl and mix in the remaining ingredients. To chop basil, twist leaves together and slice with a sharp knife. Chop strips into smaller pieces. Use salt and pepper to taste. Enjoy this unique take on traditional chicken salad! Whew! I am getting sooo busy as September creeps up! How about you? In times like these, I have to find quick, low maintenance methods of staying healthy. Running around so much and my long commutes can get me a little drained. A lot of people run to Starbucks and grab a sugary, high calorie coffee drink to perk up. Or worse, a soda! However, those options not only pack on the pounds, but they will end up making you feel even worse as you crash from all the sugar and your body starves for real nutrients. To satisfy my afternoon sweet tooth, get a little perk of caffeine, AND a nice punch of energy boosting, blood sugar stabilizing protein, I like to make coffee protein smoothies. A grande Iced Caramel Macchiato is 230 calories, while a grande Mocha Frappuccino is a whopping 400 calories! 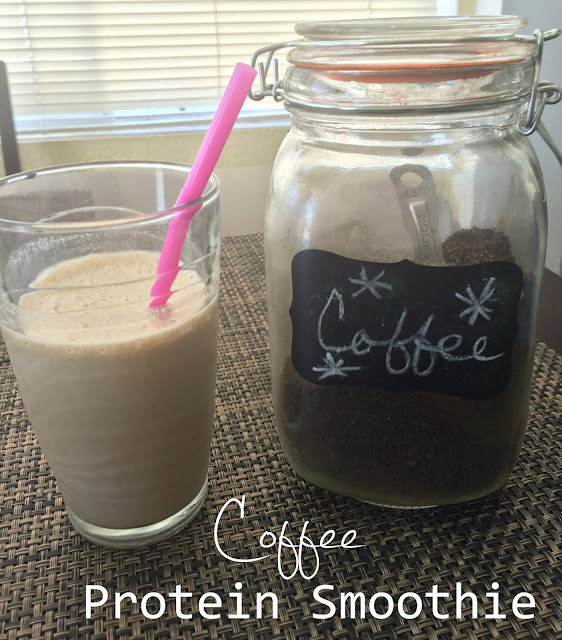 This homemade smoothie is a mere 150 calories plus has 25g of protein and healthy carbs from the banana. 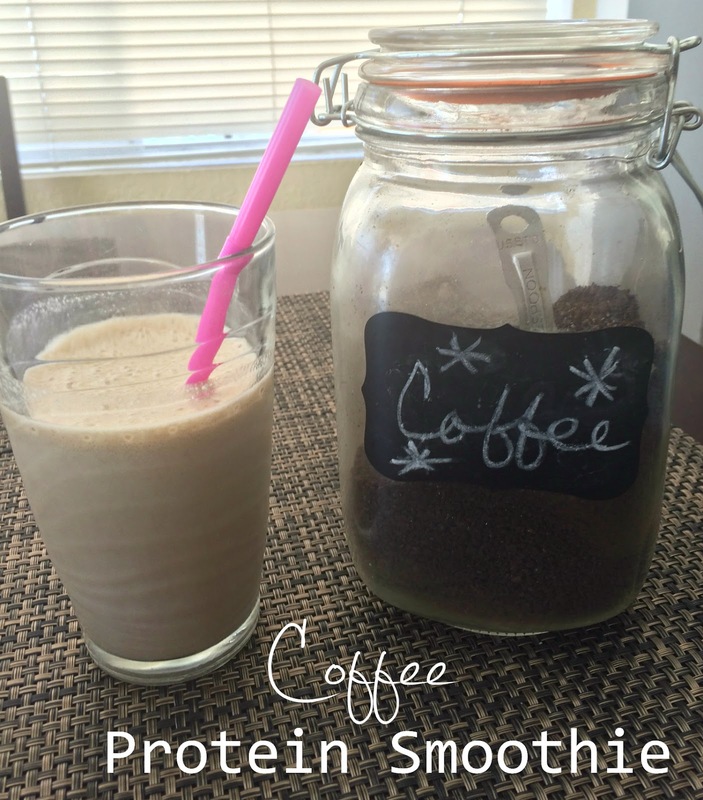 It's super simple, tastes great, and you can blend it up at your house or at your job if you have access to a blender. If not, invest in a little Nutribullet or similar. Blend all together until banana is well blended. Sip and perk up! I'm always dreaming of dessert... particularly dessert I can eat without a million calories. So the other day I decided to see what this candied banana business was all about. I embellished a little of course and added PB2 and chocolate chips for good measure. I can't even tell you how good this was. It far exceeded my expectations. The chips and PB2 get all melty... the combination of banana, PB2 and chocolate is the best. Better yet? This entire thing was only 275 calories! But it tastes like a decadent 500 calorie dessert, trust me. Prepare your PB2 according to directions on jar. Heat skillet over medium high heat and melt butter. Slice banana in half lengthwise. Once butter has melted, add in the Tbsp of coconut sugar and stir to combine. Add banana halves and sprinkle with cinnamon. Saute for 1-2 minutes per side until banana starts to become tender and caramelize on the outside. Remove from heat and plate. Drizzle PB2 over the hot banana. Sprinkle with chocolate chips. Devour. This Americana themed fruit salad was a pure accident. I just happened to have all of these fruits on hand and was really craving a big ole' bowl of some. It turned out really pretty and awesome tasting. I just threw together a sliced banana, sliced strawberries, a handful of blueberries and drizzled some honey on top. The honey really enhances the fruit flavors. Combine all fruit and drizzle with honey.